The emergence of two religious orders combining the ideals of knighthood and monasticism played a vital role in buttressing the Frankish Levant. In about 1119, a small band of knights, led by a French nobleman named Hugh of Payns, dedicated themselves to the charitable task of protecting Christian pilgrims to the Holy Land. In practical terms, at first this meant patrolling the road from Jaffa to Jerusalem, but Hugh’s group quickly gained wider recognition and patronage. The Latin patriarch soon acknowledged their status as a spiritual order, while the king himself gave them quarters in Jerusalem’s Aqsa mosque, known to the Franks as the Temple of Solomon, and from this site they gained their name: the Order of the Temple of Solomon, or the Templars. Like monks, they made vows of poverty, chastity and obedience, but, rather than dedicate themselves to lives of sheltered devotion in isolated communities, they took up sword, shield and armour to fight for Christendom and the defence of the Holy Land. As the Templars’ leader (or master), Hugh of Payns travelled to Europe in 1127 in search of validation and endorsement for his new order. Formal recognition by the Latin Church came in January 1129, at a major ecclesiastical council held at Troyes (Champagne, France). In the years to come, this official seal of approval was further garlanded by papal support and extensive privileges and immunities. The Templars also earned the endorsement of one of the Latin world’s great religious luminaries, Bernard of Clairvaux. As abbot of a Cistercian monastery, Bernard was renowned for his wisdom and trusted as an adviser in all the courts of the West. The combination of political and ecclesiastical power that he wielded was unprecedented, but in physical terms Bernard was a wreck, forced to have an open latrine trench dug next to his pew in church so that he could relieve the symptoms of an appalling chronic intestinal affliction. Around 1130 Bernard composed a treatise–titled In Praise of the New Knighthood–extolling the virtues of the Templars’ way of life. The abbot declared the order to be ‘most worthy of total admiration’, lauding its brethren as ‘true knights of Christ fight[ing] the battles of their Lord’, assured of glorious martyrdom should they die. This lyrical exhortation played a central role in popularising the Templar movement across Latin Europe, garnering acceptance for a revolutionary offshoot of crusade ideology that in many ways was the ultimate distillation and expression of Christian holy war. The example set by the Templars encouraged another charitable religious movement founded by Latins in the Near East to embrace militarisation. Since the late eleventh century, Jerusalem’s Christian quarter had contained a hospital, funded by Italian merchants and devoted to the care of pilgrims and the sick. With the Holy City’s conquest by the First Crusaders and the associated influx of pilgrim traffic, this institution, dedicated to John the Baptist and so known as the Hospital of St John, grew in power and importance. 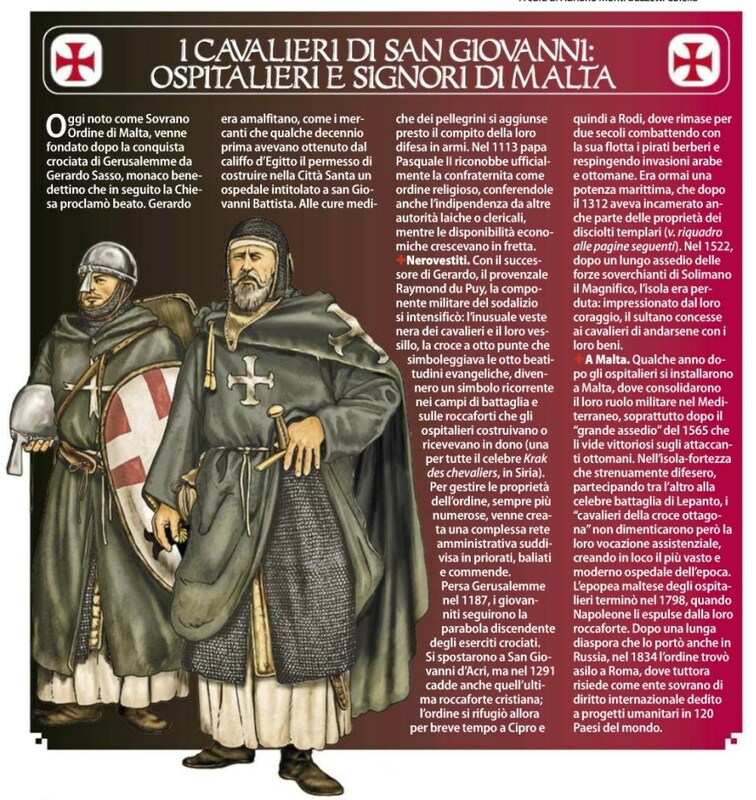 Recognised as an order by the pope in 1113, the Hospitallers, as they came to be known, began to attract widespread international patronage. Under the guidance of its master, Raymond of Le Puy (1120–60), the movement appended a martial element to its ongoing medical functions, emerging by the mid-twelfth century as the second Military Order. 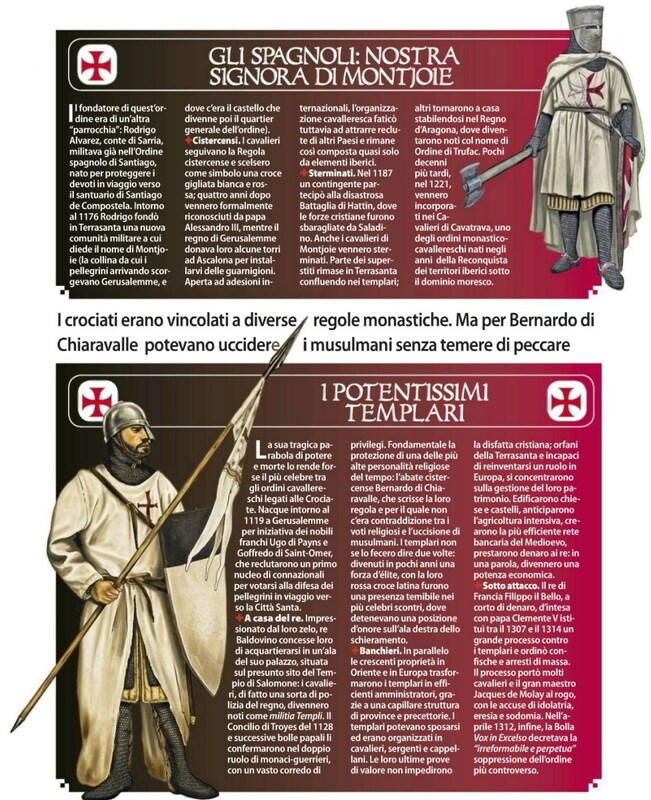 Over the course of the twelfth and thirteenth centuries, the Templars and Hospitallers stood at the heart of crusading history, playing leading roles in the war for the Holy Land. In the central Middle Ages, Latin lay nobles commonly sought to affirm their devotion to God by giving alms to religious movements, often in the form of title to land or rights to its revenue. The mercurial popularity of the Military Orders therefore brought them rich donations in Outremer and across Europe. Despite their relatively humble origins–immortalised in the Templars’ case by their seal, depicting two impoverished knights riding a single horse–both were soon endowed with enormous wealth. They also attracted a steady stream of recruits, many of whom became highly trained, well-equipped warrior-monks (as knights or lower-ranking sergeants). Most medieval European war bands were startlingly amateurish, accustomed only to fighting in short seasonal campaigns and predominantly composed of poorly drilled, lightly armed irregulars. 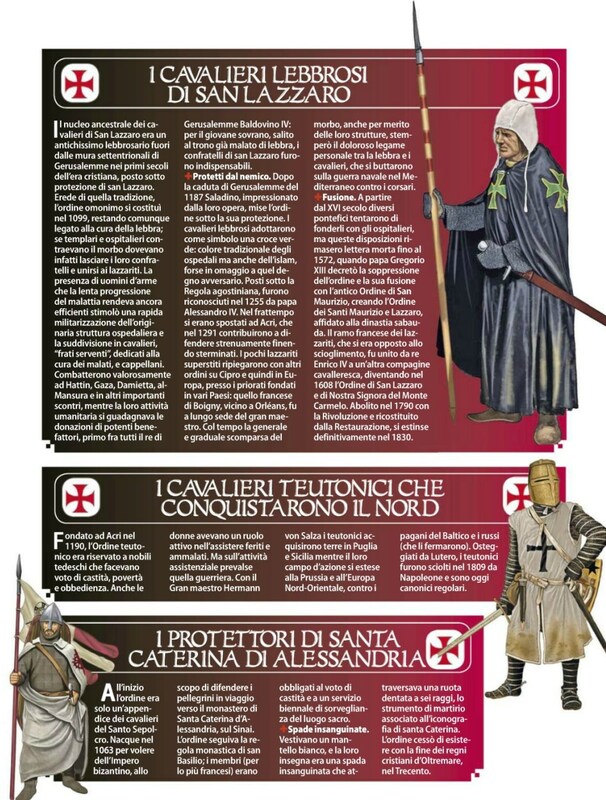 The Templars and Hospitallers, by contrast, could levy expert full-time standing forces: in effect, Latin Christendom’s first professional armies. The Military Orders became supranational movements. Primarily focused on the protection of the crusader states, they nonetheless developed an array of other European military, ecclesiastical and financial interests, including a prominent role in the Iberian frontier wars against Islam. In the Levant their unprecedented military and economic might brought them a concomitant degree of political influence. Both orders enjoyed papal patronage, gaining independence from local secular and ecclesiastical jurisdictions, and so had the potential to destabilise the Latin East’s sovereign polities. As rogue powers, they might question or even countermand crown authority, or ignore patriarchal edicts and episcopal instruction. For now, though, this danger was more than balanced by the transformative benefits of their involvement in Outremer’s defence. 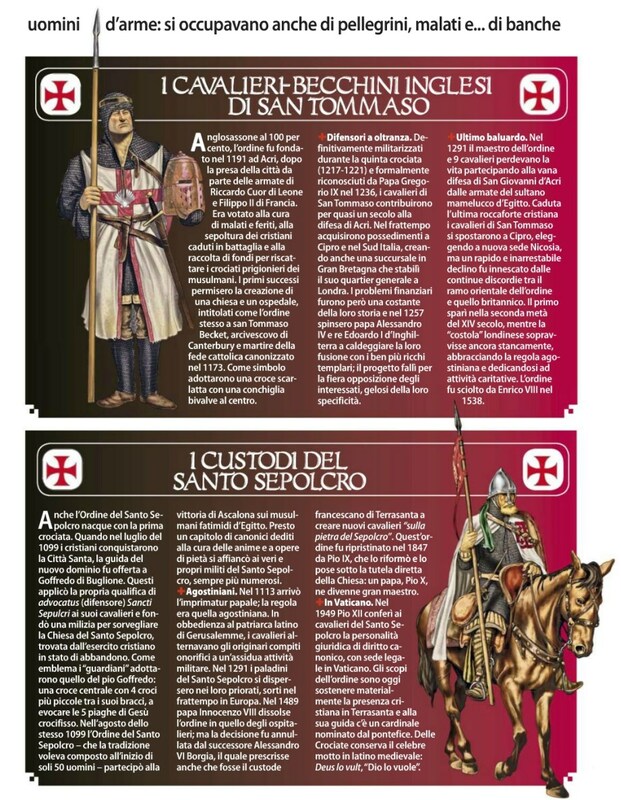 Together, the Templars and Hospitallers brought a desperately needed influx of manpower and martial expertise to crusader states starved of military resources. Crucially, they also possessed the wealth to maintain, and in time extend, Outremer’s network of forts and castles. From the 1130s onwards, the lay lords of the Latin East began ceding control of fortified sites to the orders, often allowing them to develop semi-independent enclaves in border zones. Command of the castle of Baghras gave the Templars a dominant position in the northern reaches of the Antiochene principality. Rights to Safad in Galilee and to Gaza in southern Palestine brought the order similar rights and responsibilities. The Hospitallers, meanwhile, gained centres at Krak des Chevaliers, perched above the Bouqia valley between Antioch and Tripoli, and at Bethgibelin, one of three strongholds built in southern Palestine to defend Jerusalem and exert military pressure upon Muslim-held Ascalon. Godfrey de Bouillon, the hero of the First Crusade, founded the Knights of the Holy Sepulchre in 1099 as the military guard for the Church of the Holy Sepulchre. In 1138 Pope Innocent II (r. 1130–1143) approved their religious charism as canons of the Church embracing the evangelical counsels. The order also contained knights living a secular life who vowed to defend the tomb of Christ. Operating so closely with the kings of Jerusalem initially made the order a powerful institution, but it steadily became a ceremonial and service organization. In 1847, the order was reconstituted, reorganized, and modernized by Pope Bl. Pius IX, who took on the role of grand master. The Knights of the Holy Sepulchre continue to serve the Church through their spiritual devotion to the Holy City and their assistance to Christians in the Holy Land. Although never influential in the Holy Land, the Teutonic Knights became a powerful political and military force in Eastern Europe. In spite of this, they were decisively defeated by Polish forces at the Battle of Tannenberg on July 15, 1410. The devastation wrought by this defeat severely limited their influence and effectiveness. Although their numbers dwindled through the centuries, they continued to exist as a small order of nobility centered in Austria. Already limited in activity, they suffered even greater loss when twelve knights were hanged in 1944 by the Nazi German government for their role in the assassination plot against Adolf Hitler.